Wishing cookies are another tradition we have my Mom’s Minnesotan childhood to thank for. 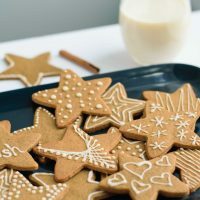 These cookies, which I believe are also called Swedish ginger cookies, or pepparkakor, are a crisp, well-spiced, lightly molasses flavored cookies. The tradition goes, take a cookie, make a wish, place it in the palm of your hand, then press in the center of the cookie. If it breaks into 3 pieces, eat the cookie without speaking and your wish is said to come true! 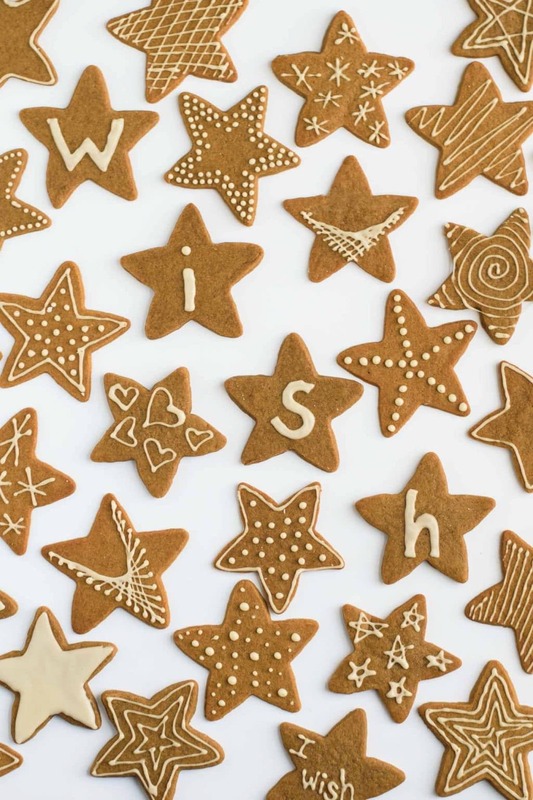 The fact (yes, fact*), that you get to eat cookies and have wishes GUARANTEED (yes, guaranteed*) to come true makes these the best cookies to ever exist in the entire history of cookie existence. So it’s probably pretty clear why these cookies were my favorite growing up. With years of cookie-breaking practice under my belt, I’m pretty excellent at breaking cookies into 3 pieces almost every single time. But, never fear, if you are decades behind me in wishing cookie consumption, and regularly fail at breaking into three pieces (hi, Omar), that just means you get to eat more cookies until you get a perfect 3 (I’m a little jealous). The other best part of these cookies is that you get to decorate them. 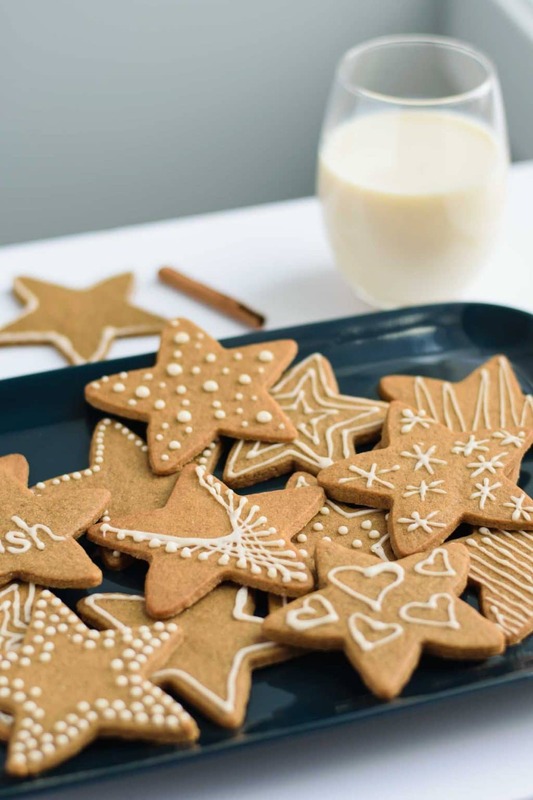 A simple powdered sugar icing contrasts beautifully with the spiced cookies. Back in the day, I opted for a big smear of icing to cover the entire cookie, to deliver a shock of vanilla sugar to every single bite. These days, I prefer the light lines of icing drizzled sparingly over the cookie for the perfect hint of sweet. For you, it’s whatever makes you most happy. Mix and match if you’d like! Like the peppermint candy cane cookies, I’m 98% sure the recipe for these cookies also came from the 1985 edition of Better Homes and Gardens Cookies for Christmas (linking in case anyone wants to buy me–I mean themselves–a copy). I have no idea what they were called in that book, but I recreated the recipe through extensive internet research. The more Minnesotan the source, the better! But really most recipes were about the same, and veganizing them was a cinch! I swapped out vegan butter for the dairy, and aquafaba (the liquid from a can of beans) for the egg. See, really not complicated at all! The dough is quickly made with handheld electric beaters or a stand mixer, and then I borrowed a tip from Smitten Kitchen on fast forwarding through rolled cookies. The basic idea is to skip that 2+ hours chilling step for faster cookie gratification. To do this, we roll and press out the soft dough between sheets of parchment paper, then freeze the whole sheet of dough for just 15 minutes. This chills the dough enough to cut and transfer the cut shapes and bake and have them keep their shape. I think this method works quite well, though if I were making really detailed cut outs that I don’t want *any* spreading or stretching on I’d probably not skip the long chilling step. 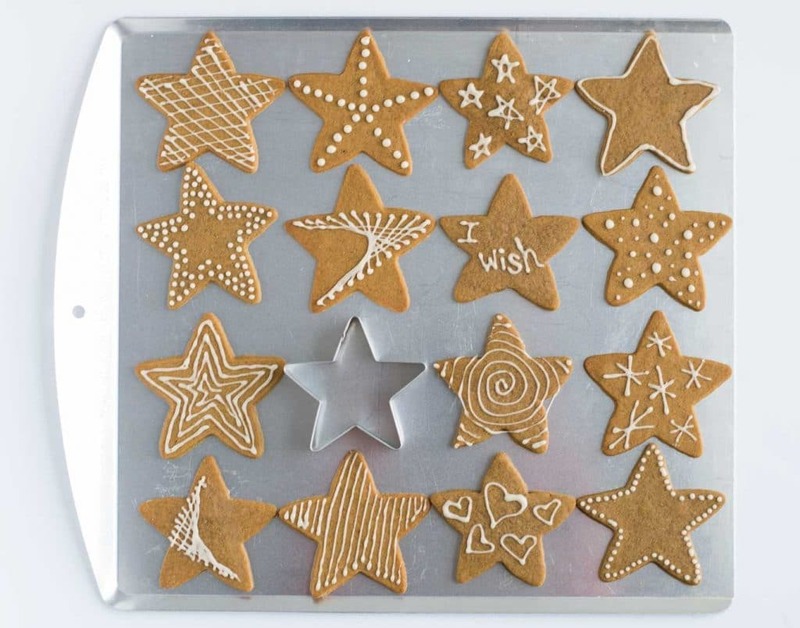 That being said, this method works wonderfully for these star-shaped cookies. For best cookie-breaking results you want to roll these cookies on the thinner side, 1/8″ thick. A thicker cookie will be more likely to remain soft and harder to break. 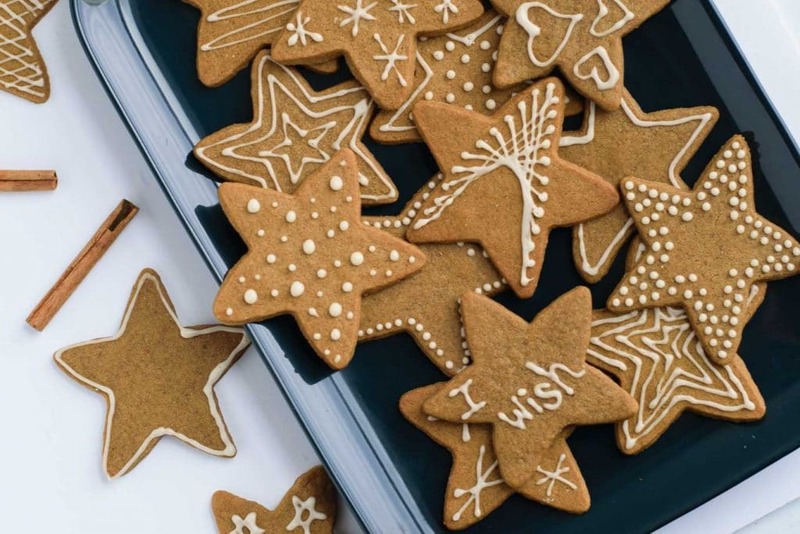 The cookies are perfectly spiced with cinnamon, ginger, nutmeg, and orange zest. I found versions with allspice, or clove instead of the nutmeg, or in addition to it, so feel free to swap out if you’d like, but don’t skip or skimp the cinnamon or ground ginger. And while the orange zest is technically optional, I think it brings a wonderful orange-scented freshness to the cookies, and that bitter-sweet quality that balances out the molasses so perfectly. Now, I’m not actually a big molasses fan, so it’s a bit surprising that I love these cookies so much, and that they were always my Christmas cookie pick without fail. But these cookies are not overpoweringly molasses flavored. And molasses is so good for you, it’s a great source of iron, calcium, magnesium, B6 and more. So, if I’m not the type to swirl it into oatmeal, at least there’s one molasses-containing cookie out there I’ll enjoy. And with 1 tablespoon divided between 36-odd cookies, it’s clearly a great source of vitamins! Haha, okay, I kid, but really it’s not a bad deal to eat some molasses cookies. Well it’s been a happy week of cookie baking and eating, though like molasses, a bit bittersweet as my sisters, mom, and cousin aren’t here to bake with me. I do hope you’ve enjoyed this week’s cookie posts as much as I did, and bake yourselves some candy cane cookies and wishing cookies this weekend. And may all your wishes come true! If you try this recipe, let me know! 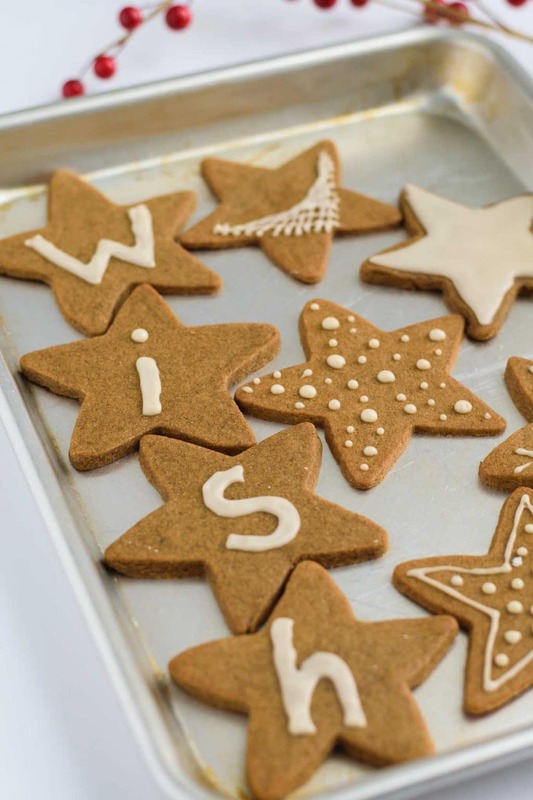 Leave a comment below, and let me know your favorite holiday cookies or memories! Tag your photos @thecuriouschickpea and #thecuriouschickpea on Instagram, or share with me on Facebook. Happy holidays everyone! Note: best holidays typically involve making lots of parabola decorated cookies. I used Earth Balance Buttery Sticks in this recipe, while other vegan butters should work, avoid tub and spread-butters as they have too much liquid in them for baking. Make sure to use regular molasses, and not blackstrap. Well that being said, I’ve made these with blackstrap and it’s fine as only a small amount is used. But for the a milder molasses flavor, you can use either light or dark molasses. Aquafaba is the liquid from cooking beans. Chickpeas create some of the best aquafaba, and it’s easiest to collect it from a can. 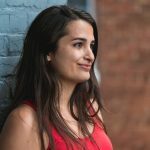 When separating the liquid from a can of beans, first shake the can before opening to loosen and distribute the starches and proteins that settle on bottom. Strain the liquid to separate it from the beans, and then for this recipe you will need to reduce the aquafaba. Reduce it by half the volume by simmering over the stove, checking after 5 minutes every minute or two until you have half the amount. You can then use right away or freeze the liquid until you’re ready to use it (make sure to label it!). If you want to make the dough in advance, you can form it into a ball, wrap tightly, and place in the fridge for 2 hours up to 2 days. Then, skip the post-rolling freezing step as there is no need to do that! You can roll the thoroughly chilled dough out on parchment or a lightly floured counter. Let the vegan butter sit out on the counter to soften for about 15 minutes while you gather the rest of your ingredients. Preheat your oven to 375 ºF. In a large mixing bowl beat your vegan butter with an electric mixer until it is fluffy and creamy. Then add the sugar, aquafaba, molasses, and orange zest and beat the mixture again until everything is creamed and fluffy, this can take a few minutes. In a separate mixing bowl whisk together the flour, baking soda, cinnamon, ginger, nutmeg, and salt to combine. Then, add the dry ingredients to the wet and using electric beaters, mix until a smooth dough forms. Turn the dough out onto a large sheet of parchment paper and press it into a thick disk. Then, cover it with a second large piece of parchment paper and use a rolling pin to roll the dough to 1/8" thick. As you roll the dough, regularly peel back and replace the top sheet of parchment paper, then flip the dough over so the top parchment becomes the bottom, and then peel back and replace the new top sheet of parchment as well. Repeating this processes a few times will remove the creases that the parchment would otherwise cause in the dough and also helps prevent sticking. Transfer the rolled dough onto a baking sheet and then place it in the freezer for 15 minutes to firm up. After 15 minutes in the freezer, remove the dough peel back top parchment, replace it, then flip the dough over and peel off the the new top side parchment. This will prevent the dough from sticking as you try and move the stars to the baking sheet. 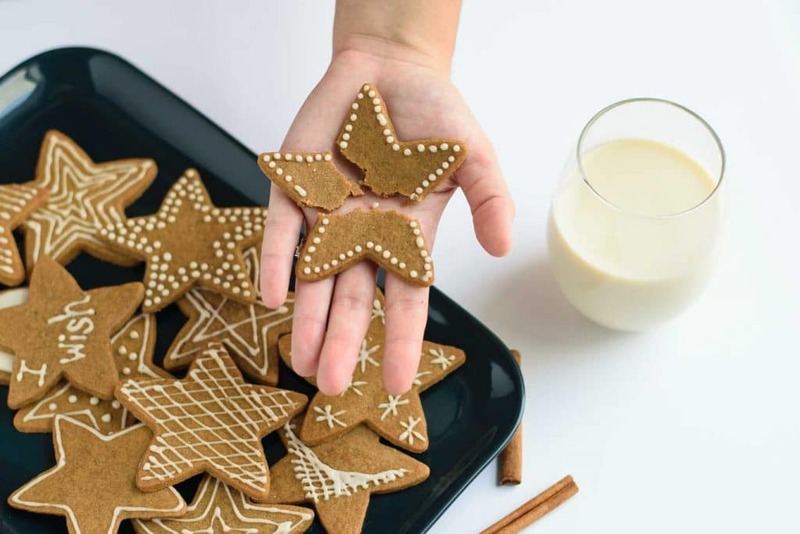 Cut out stars using a ~3" star shaped cookie cutter. Place the cookies onto an ungreased baking sheet (you can use a parchment lined sheet for easier cleanup if desired) leaving a little room, ~1/2" between the closest points, between each cookie. They shouldn't spread too much in the oven. Take the scraps and re-roll and cut as necessary, freezing for 5-10 minutes if the dough becomes too soft and difficult to cut/transfer the shapes. Bake the cookies at 375 ºF for 8-10 minutes, or until the edges are just a shade darker (which can be hard to see, especially if you use dark or blackstrap style molasses), then let them cool on the baking trays for 5 minutes before transferring to a cookie sheet to cool completely. If baking more than one tray at a time, place one on a rack just one spot above center and one on a rack one spot lower than center and switch the trays halfway through baking. In a small mixing bowl, whisk together the sifted powdered sugar, vanilla extract, and plant milk with a fork. The icing should be stiff enough that when you run a spoon through it, it separates and takes a moment before it runs to fill in the line. And, it should be thin enough that it will run easily off a fork or a spoon, though take a moment before settling back into the rest of the icing. If needed, add a little more powdered sugar or milk until you reach the desired consistency. Decorate the cookies with a piping bag and a tip with a very small hole, or just spread some on each cookie with a knife.